Sunday was the 6th January, Twelfth Night, when you should have been taking down your Christmas decorations, as well as celebrating Epiphany, the coming of the wise men bringing gifts to the infant Jesus. I left Linda to take down our tree (it goes back in the garden for next year, though we do have a couple of 30 footers that grew too big to bring back in the house) and went to Bankside in Southwark, where the Lions Part put on an annual performance for Twelfth Night, based on traditional celebrations with a largely pagan root. 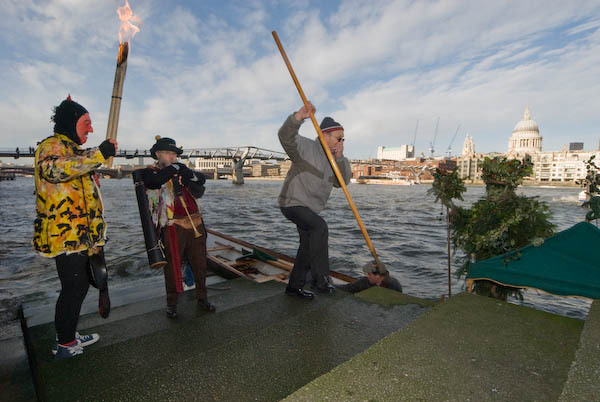 These included a splendid ‘Holly Man’ who arrived by river, considerable wassailing, and a performance by the Bankside Mummers with ‘St George’, sword fights and much more. 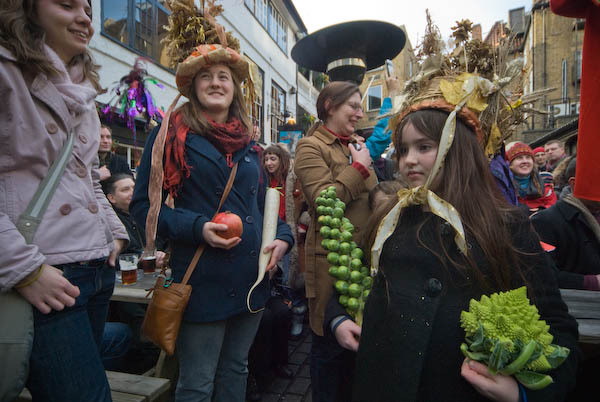 Cakes were distributed and eaten, and the lucky recipients of the two that contained a pea and a bean became king and queen for the day, leading the procession to the George Inn for further festivities. The King and Queen with crown, orb and sceptre. Its nice to see something made of the kind of photographic material that is on virtually everyone’s doorstep. You don’t need special facilities, overseas travel, etc to make some interesting work. I think it was the great Alfred Stieglitz who said something like the best pictures being found within 25 yards of one’s garden gate. This entry was posted on Wednesday, January 9th, 2008 at 08:28 pm and is filed under My Own Work, Photographers. You can follow any responses to this entry through the RSS 2.0 feed. You can leave a response, or trackback from your own site.